This year at our Super Bowl party, Mike's aunts brought over supplies to make a new-to-us frozen drink. According to them, it's an "old lady" drink they used to have "way back in the day." They were absolutely delicious. All you need is vanilla ice cream, Kahlua, and Creme de Cocoa. For each one drink you want to make, combine 2 shot glasses of Kahlua, 2 shot glasses of Creme de Cocoa, and a scoop of vanilla in the blender. Seriously, you're going to thank me for this one. Yummm! 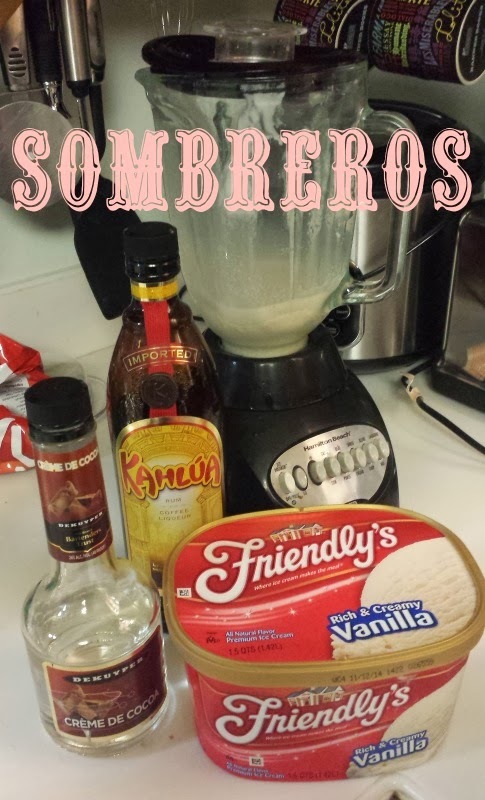 They did a frozen drink like this in Mexico and it was one of our faves! I've never heard of this, but it sounds SO GOOD! That sounds so good. Love Kahlua but haven't had it in forever. I dont do many mixed drinks, but this sure does sound good! I can't wait to try this once I am done with this stupid diet! Oh gracious this looks so good!!! !